COMAC signs purchase agreement of ARJ21 aircraft with Genghis Khan Airlines__Commercial Aircraft Corporation of China, Ltd.
China's first operational fleet composed of China-made jets to be settled in Inner Mongolia. Commercial Aircraft Corporation of China, Ltd. (COMAC) signed a purchase agreement of ARJ21 aircraft with Genghis Khan Airlines in Beijing on October 15th, 2018, planning to deliver the first batch of ARJ21 aircraft to Genghis Khan Airlines by the end of this year and launch the maiden flight in early 2019. China's first operational fleet composed of China-made jets will be settled in Inner Mongolia. Mdm Bu Xiaolin, Chairperson of Inner Mongolia, Mr. Xin Guobin, Vice Minister of the Ministry of Industry and Information Technology (MIIT), Mr. He Dongfeng, Secretary of the Party Committee and Chairman of COMAC, Mdm Ai Lihua, Vice Chairperson of Inner Mongolia, Mr. Lv Erxue, Deputy Director of Civil Aviation Administration of China (CAAC), Mr. Hao Yutao, Chairman of Genghis Khan Airlines, Mr. Zhao Yuerang, Deputy Secretary of the Party Committee and President of COMAC, Mr. Liu Linzong, Deputy Secretary of the Party Committee and Vice President of COMAC, Mr. Cheng Fubo, Member of Standing Committee of the Party Committee and Vice President of COMAC, and officers and representatives of relevant governmental departments and enterprises attended the signing ceremony. Mr. He Dongfeng expressed that he was grateful to Genghis Khan Airlines for its trust and recognition on the China-made jets, COMAC would fully support Genghis Khan Airlines in the operation of ARJ21 aircraft, let ARJ21 aircraft become an indispensable force in the aviation transportation network of Inner Mongolia, boost the development of the regional aviation and economy in Inner Mongolia, jointly explore the regional aviation development path and mode with Chinese characteristics, and promote the marketing and industrial development of ARJ21 aircraft. Mr. Hao Yutao expressed that ARJ21 aircraft has excellent performance in severe cold and plateau conditions, and could meet the requirements of take-off and landing at the airports in western China and obstacle clearance along complex routes, which is highly in line with the requirements of aviation market in Inner Mongolia. Genghis Khan Airlines, as the first regional airline in Inner Mongolia, was pleased to be the first operator of ARJ21 fleet, believed that ARJ21 aircraft would have a vast market prospect in Inner Mongolia, and hoped that both sides could jointly build a benchmark platform for the life community of China-made commercial aircraft. Genghis Khan Airlines is the first regional airline in Inner Mongolia. 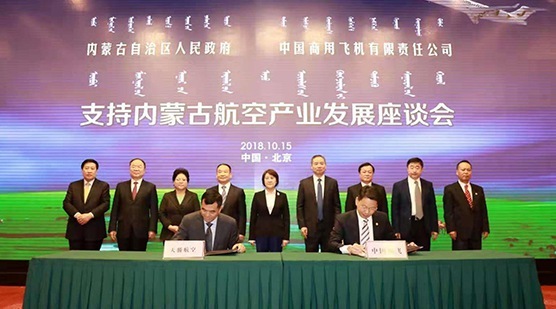 It was invested by Inner Mongolia Communications Investment (Group) Co., Ltd. according to the entrustment of the People's Government of Inner Mongolia Autonomous Region, and approved by CAAC to make preparations on March 30th, 2018. It takes Hohhot Baita International Airport as the principal operation base, and has planned to build a fleet of 25 aircraft in 5 years.